I originally wrote this blog for our board game company on running the Happy Mitten Podcast. I’ve updated and tweaked some of the content for the purposes of JeffLarge.com. Recently, I posted a blog on the planning, equipment, and setup of our podcast. It covered information like what I include in my emails to interviewees, the type of equipment I’m using and how we’re using it. In this blog, I continue those thoughts and explain my personal workflow including how we record, my editing process, and getting the file posted online. If you read the previous post, you’ll notice by my setup I purposely avoid recording directly onto the computer. This is not common practice for most of the podcasters I know, however, I wouldn’t do it any other way. 1. Computers aren’t 100% reliable- they crash, have electronic hums, etc. 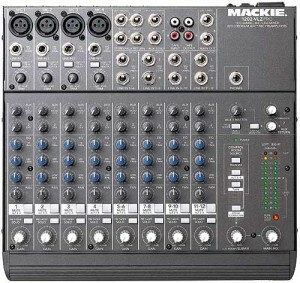 By recording directly onto the recorder from the mixer, I never have to worry about glitches in the software, the computer crashing or losing files, and other unforeseen problems. I’m not willing to lose an amazing recording/ interview because of a random technological mishap. 2. It drastically reduces my editing time. With our setup, most of the work is done on the front end (balancing levels, inserting music, etc). It also forces us to do clean takes and re-record less. I still edit the post before it goes live but it takes a lot less time overall. 1. Review the notes/ interview questions. There is a balance between being scripted and letting it flow. My personal preference is to not be too much of either. We typically have a plan to guide us but remain open to interesting twists and turns in the conversation. 2. Sound check. A lot goes into solid sound but we try to keep it simple. Speak clearly and directly into the mic. On the mixer, our gain, highs, mids, and lows are all set somewhere between 11 and 1 o’clock and nothing is maxed out volume-wise. I check each channel (voice, music input, etc) individually. The ideal level going into the recorder is in-between -12db and -6db. Don’t ever let the volume peak. Last, we always use headphones to monitor what’s going on. 3. Record. We record the whole show in one take from start to finish. Music is faded in and out during the show. This forces us to be really conscious of what we’re saying and leaves no room for retakes. Editing can be one of the most time-consuming aspects of podcasting. I was very intentional about building my setup to reduce the need for editing. 1. Upload the audio file (typically in wav) from the digital recorder to the computer. 2. 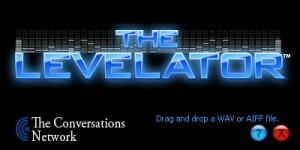 Run the file through software called Levelator by The Conversation Network. It basically does the same thing as the Behringer MDX-4600 Compressor/Limiter/Gate. The main difference is the Behringer unit costs about $150 and Levelator is free software. -Use the Noise Removal effect. *The trick to this effect is to first highlight a section of the track that is only background noise. Select the “noise removal” tool under “effects” and select “Get Noise Profile” and click “OK.” Last, highlight the entire track, go back to “noise removal” and choose to remove the noise. -Finally I export the file as a MP3 without tagging the file. There are a lot of services and platforms to consider when creating a podcast. iTunes is the most important and others like Stitcher exist as well. Depending on your niche, many podcast networks and aggregation sites can also help get you noticed. My following advice assumes you have those things figured out and it just needs to be posted. Before pushing anything to the web, I make sure the file is properly tagged. Many people will download the MP3s directly and if your file isn’t properly named, you are missing out on opportunities. I use WinSCP or Filezilla’s SFTP option to move data back and forth from my servers and computer. One thing we’ve done in the past that I recommend NOT doing is having your audio files hosted on the same server as your website. This is a bad idea on many accounts; slower response times of the podcast and the site, if the site goes down so does the cast, etc. The main reason we did this was to save money but it is NOT a long term solution. The hosting companies that offer “unlimited” space/ bandwith/ whatever aren’t entirely telling the truth, especially if the server space is shared. In a worse case scenario, the response to a popular podcast could crash a site and other sites within a shared space. We will be moving all of our audio files to a media hosting service like libsyn.com or blubrry.com in the near future. These are services that strictly handle media like audio files and are intended for hosting podcasts. UPDATE: Several months ago we broke the internet and crashed the Happy Mitten website as well as the Happy Mitten Podcast due to the above setup. Since then, we officially moved everything to Libsyn and pay $15 for the 250mb per month plan. The loading times are faster and we haven’t experienced any problems yet. I would highly recommend the site if you’re looking for a media host. After the audio file is uploaded to the web, I build the post with our blubrry plugin. If you have a WordPress-based site it’s incredibly easy to use if it’s compatible with your theme.In the beginning, it did not like my theme at all and I had a lot of ridiculous issues. However, the help of Blubrry was EXCELLENT (and I’m hard to please when it comes to customer service). Over the course of a weekend, I had a 20+ thread of emails going back and forth with the developer of the plugin until we were able to get it fixed. Based on that, the features, and general ease of use, using Blubrry is a no-brainer. When set up properly, Blubrry automatically syncs with your iTunes account (which is very easy to set up as well- see below for helpful links) when you created the post. That’s it! That is everything we do to get the sound and content quality you’ve come to expect from Happy Mitten. Another thing you should consider if you want to do a podcast is picking a niche. The topic of board games is huge. We’ve focused more on the business side of things as we continue building ours. Not only does it offer solid content to our audience, but we are learning a vast amount of information in the process. Other things you might want to think about are consistency and longevity. Are you podcasting about a topic you enjoy enough to do 50 episodes about? 100 episodes? Do you have the discipline to get your podcasts out in a predictable manner? For us, we post content every Monday, usually around 9:00am EST. We alternate each week between our podcast and blog posts. Ideally, a weekly podcast would be best but that’s simply more time than we can dedicate at this time. NOTE: I will be seeking help with this soon to help save us time. It’s a crucial part of our business model to run the podcast but it’s not necessary that I edit it. I’m hoping to find a trustworthy fan to take over that part of producing the podcast. Last, but definitely not least…have fun! I spent most of the last two posts explaining all the planning and logistics to our podcast. Those things are important but if you’re not enjoying yourself, it will show. Yes, there are days that preparing or editing is annoying. Even so, if you enjoy it, podcasting should be worth it. I’d be interested in a trial run of editing your podcast. I have a bunch of free time over the next month especially since I am on a work sabbatical. DM me on Twitter (@frahminator) or email at brian dot frahm at gmail dot com.